Jessica and Cameron were lucky enough to have their wedding at the Powel Crosley Estate in Sarasota. So – we had to photograph their engagement session at a venue equally as amazing! The Ca’ d’Zan Mansion is on the property of the John and Mable Ringling Museum of Art. The Mansion was built in the 1920s. . Ca' d'Zan, a Mediterranean Revival residence in Sarasota, Florida, was the winter home of the American circus owner, developer and art collector John Ringling and his wife Mable. Lovers of the Venetian aesthetic, the Ringlings chose the site overlooking Sarasota Bay for its vista, which reminded them of the lagoon of their favorite city. 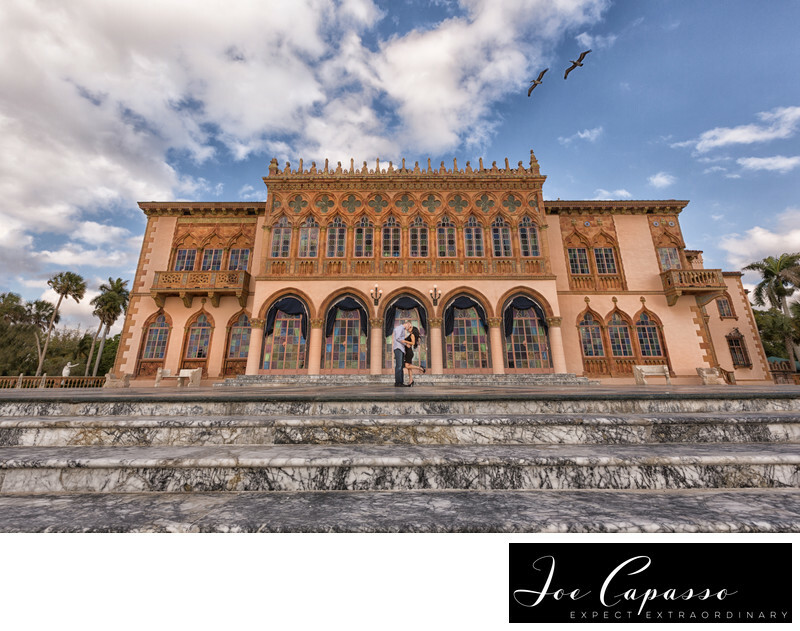 The Ringling Museum of Art provides endless opportunities for amazing wedding photography. From the beautiful rose garden, a breathtaking view of Sarasota bay, to epic banyan trees, you just might have to get married twice to have enough time to take photos in every location this Sarasota wedding venue has to offer! Having both your wedding and wedding reception on the Ringling Museum property would be an event your friends and family would remember for a lifetime. This picture was taken on the waterfront side of the property. Two large birds happened to fly into the frame at the precise moment we took the picture. A lot of people think we photo-shopped them into the image because it almost looks too perfect, but that's exactly how it happened! This is just one of many images from Jess and Cameron's engagement session. If you check the blog area and do a search for Ringling Museum you will find the rest of the shoot. Keywords: Ca' d'Zan (3), Ca' d'Zan Mansion (3), ringling museum (3), sarasota (6), sarasota engagement session (6), sarasota wedding (9), sarasota wedding venue (3), sarasota weddings (3). 1/200; f/8.0; ISO 100; 16.0 mm.